What a difference a cold winter makes. As we shiver down here in Louisiana and are glad we didn't have to spend the night in our cars in Atlanta, gas fans can at least see a silver lining in the recent brutal temperatures as the level of natural gas in storage sinks and gas prices rise. But I view this as the work of a cold winter rather than a fundamental, sustainable change on the demand side. It's a break in the clouds but also a window of opportunity. As the chart below shows, in the past couple of years, gas supplies started the year well above the five year average levels (+15.2% in 2012 - light blue line - and +12.4% in 2013 - dark blue line). The warm winter of 2011-2 winter drove up storage levels to max out at 60.5% above average in early April 2012. 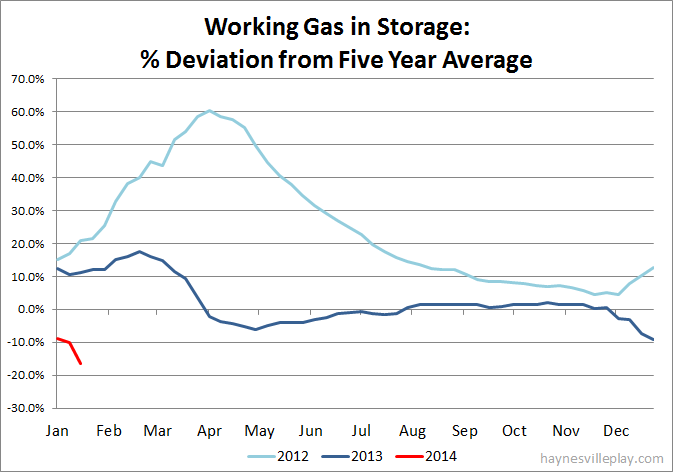 Reduced gas production and a hot summer helped bleed off much of the excess surplus for the rest of 2012, but the storage level didn't get back in line with the five year average until April 2013, and it was give and take for the rest of the year. Fast forward to today, storage levels are 437 Bcf, or 16.6%, below the five year average (red line). That's a big chunk, but the deficit is less meaningful now than it was in the past. Before the advent of shale gas, this deficit would have been troubling and would have taken a long time to refill. Now it feels like a blip, but it's one of the few positive blips gas producers have seen in the past five years. Gas prices have surged past $5/MMBtu in both the spot and futures markets, but that's unlikely to hold much longer. Hopefully producers have deployed their traders to lock in some future gas production at these prices. But what hasn't changed is the rig count. As of last week, there were 356 gas-directed rigs running in the U.S. That's about 7% below last year's average rig count. While rig count is no longer a reliable indicator of production, especially given the associated gas from all of the new oil wells, the fact remains that gas wells deplete quickly and a stable to declining rig count does not indicate increased production. While there is no fundamental change in the gas market afoot, there is a pretty good window of opportunity for a producer that is able to lock in some good future prices and gutsy enough to ramp up its dry gas operations while all of the investors and analysts are still pining away for liquids. Put a few new rigs in the Good Old Haynesville and you can pretty much lock in a pretty sweet arbitrage opportunity. Chesapeake Energy. CHK has ramped up its rig count from one to seven in a short time, but they aren't the gunslinger they once were. But the Ole Gunslinger himself, ex-CEO Aubrey McClendon, is pushing the company to you-know-what-or-get-off-the-pot with its Haynesville acreage, so you might see some more activity from them, either in the form of a little greenmail sale of acreage or some increased production (last week the company permitted ten new wells in Caddo and DeSoto). Petrohawk. I think these guys are ready to do more business in the Haynesville. Last year, parent company BHP Billiton was forced to do a big write-down of its purchase of Petrohawk, which left it with egg on its face. But a little surge in the gas market might make the Haynesville look more attractive. To quote the company from a December presentation: "We have flexibility in our Shale portfolio to time investment for maximum value." Right now Petrohawk is focused on the Eagle Ford, but they also recently started some Haynesville pad drilling in Bossier. I'd keep an eye on them. Encana. Is it me, or does Encana seem to be turning away from anything southeast of the Rockies? They still tout the Tuscaloosa Marine Shale, but I'm not really feeling the love, especially after they consolidated operations to Denver. Will they be the first "Haynesville Founder" to exit the play? Suppressed gas prices have made a big Haynesville sale unlikely, but will this be enough of a window to exit? Selling its Haynesville acreage would really skew the company's assets from dry to wet and would look good on a PowerPoint presentation. Any potential buyer likely would be motivated to deploy some rigs rather than sit on this big purchase. I rate this occurrence lower than 50%, but I think it's on the table. Shell/SWEPI. They've also been pretty quiet of late, but the parent company sure is making some noise. Royal Dutch Shell issued a rare profit warning this quarter and last month cancelled a big gas to liquids project slated for SE Louisiana that would have used Haynesville gas. They are Encana's joint venture partner in the Haynesville. Might they be looking at the door too? Unlikely, I think. They still have lots of operations in the region and the Haynesville offers only upside to the company at this point with very little downside. The media often mentions that Shell was late to shale, but they forget the company's quiet early presence in the Haynesville and only remember its expensive purchase of East Resources in the Marcellus. True, Shell is not built for shale exploration, but I don't see them ditching the Haynesville just yet. Anadarko. They seem to be fat and happy drilling for gas and liquids in Panola Co. These higher prices will juice their already juiced returns, but will it lead to a few more rigs, at least temporarily? Maybe. The program is in already in place, so I don't see it being a stretch to see a couple more rigs turned towards the Haynesville. XTO Energy. I don't know. They seem to be scattering their shots lately, as shown by the first Haynesville well being drilled in Marion Co., TX. EXCO Resources. Last September, the company was planning for six rigs in the Haynesville in 2014, but then came a management shakeup with the CEO being shown the door. The December capex guidance for 2014 showed four Haynesville rigs. EXCO has been stuck on three rigs since August 2013, so if the December guidance is real, another one should be on the way. EOG Resources. EOG currently has its highest Haynesville rig count (two) since July 2012, but they seem to come and go freely. They permit a couple Texas wells at a time, drill them and go. EOG was one of the first companies to embrace liquids, so the company's devotion to the Haynesville has been fleeting. I don't expect additional activity from them. This is all speculation on my part. While I like to see storage levels plunge and gas prices rise, my greatest fear is that it will spook some of the new gas consumers, most notably utilities and manufacturers. The good news is that while gas prices have gone up, they have not gone through the roof (except in a few cases at citygate locations). While the price increases have been significant on a percentage basis, they still do not resemble the extreme volatility the gas market has shown in the decades before 2009. I think most large consumers view this as a seasonal issue for a commodity that has been underpriced for almost five years. Great post Robert. Very well reasoned.